Natural Health News — Children in England are being exposed to a cocktail of pesticide residues in the fresh produce they receive through a free school fruit and vegetable scheme, according to a new report. Pesticide Action Network UK (PAN-UK) says the pesticides have documented potential to harm human health, especially the health of young children who are particularly vulnerable to their impacts. 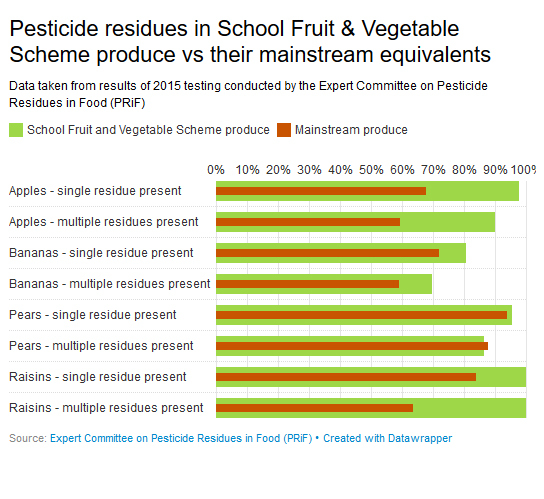 For the report, Food for Thought, PAN-UK analysed the last 12 years of residue data published by the Expert Committee on Pesticide Residues in Food (PRiF) and found that there are unacceptable levels of pesticides present in the free produce supplied to four to six-year olds under the Department of Health’s School Fruit and Vegetable Scheme. 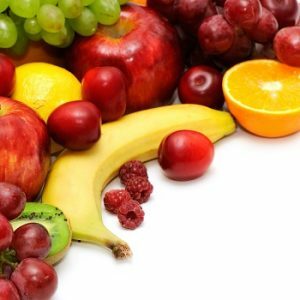 Since 2004, the Department of Health (DoH) has sought to promote healthy eating by providing one piece of fruit or vegetable every school day to children aged four to six years in England. The School Fruit and Vegetable Scheme (SFVS) reaches about 2.3 million children in 16,300 schools and costs about £40m a year. 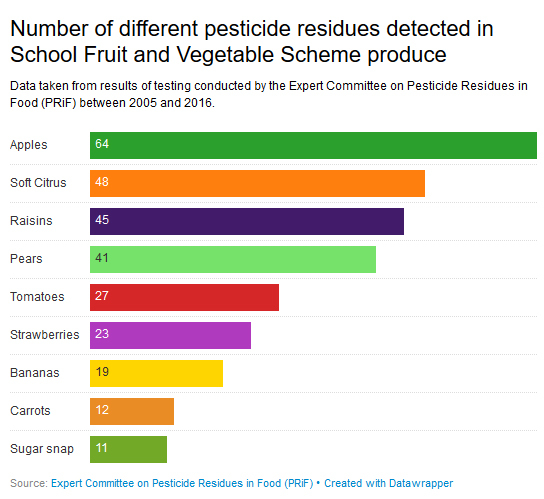 » A new report from Pesticide Action Network UK has found multiple pesticide residues in the free fruit and vegetables handed out to young children in England under a government scheme. 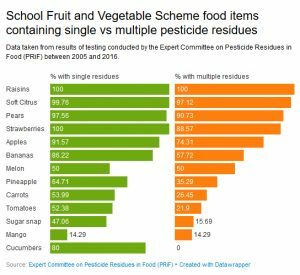 » In some cases levels of pesticides known to be harmful to children were higher in school produce than in the produce that can be bought in supermarkets. » It would cost only 1p per child per day to make the switch to free organic fruit and vegetables for school children. The report is bad news for parents and for children who are soon to return to school after the summer holidays. Residues of 123 different pesticides were found, some of which are linked to serious health problems such as cancer and disruption of the hormone system. The UK government argues that levels found were within official ‘safe’ limits, but this ignores the fact that in many cases, multiple residues were found on the produce. 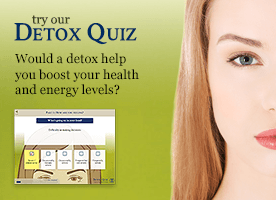 This is another area of serious concern as the scientific community has little understanding about the complex interaction of different chemicals in what is termed the ‘cocktail’ effect. 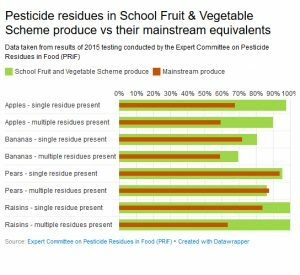 The report also found that the levels of residues contained on SFVS produce – specifically apples, bananas and raisins – are higher than those in produce tested under the national residue testing scheme i.e. the mainstream produce found on supermarket shelves. It’s not clear why this should be. The most commonly found residue was the fungicide imazalil, which is linked to developmental problems and may be carcinogenic. Its use is discouraged by the Fairtrade scheme which covers most mainstream bananas in UK supermarkets. However bananas in the SFVS scheme are not Fairtrade, which may explain the difference. In addition only around 30% of the produce is supplied from UK growers. This is understandable with bananas, less so with apples. PAN UK would like to see more produce sourced from the UK and, specifically, from organic growers. The additional costs, according to its analysis, are not restrictive – approximately 1p per day per child. The benefits in terms of helping to grow the UK organic sector and protecting young children from the effects of pesticides are priceless. We have previously reported on the risks of consuming pesticides. In 2016 an EU wide report from the Europe food Safety Authority found that as much as 46.3% of the analysed food contained residue from at least one pesticide. In 2014 French health and environmental group Générations Futures launched the third in a series of reports which showed that young children living and/or attending school in agricultural areas had an average of 21 residues of endocrine disrupting pesticides in samples of their hair. In 2012 the American Academy of Pediatrics issued a new policy statement acknowledging children’s unique vulnerability to pesticides and saying that children should have as little exposure to pesticides as possible. Recently a study of more than 500,000 births to women living in a farming region of California found that those who were the most exposed to pesticides experienced a 5-9% increase in problems such as premature births and abnormalities.